Are you interested in a hot air balloon flight? You can enjoy this amazing experience - just fill in the form on the left (you can select from a ballooning experience at the Hartbeespoort, the Cradle of Humankind, Hoedpspruit or even the Pilanesberg National Park - prices vary by venue). By booking with SouthAfrica.TO you qualify to earn travel vouchers - merely email a review of your hot air ballooning flight & photos to cheapflights@southafrica.to and we will send you travel vouchers. You experience total peace and tranquillity over some of the most splendid scenery our country has to offer, with nothing to disturb the peace but the occasional hiss of the burners above you. There are no age restrictions as to who can fly, however, passengers must be at least 1.2m tall (enough to see over the edge of the basket), climb in and out of the basket unaided, be able to stand for the duration of the flight and be able to crouch during the landing. We recommend that pregnant woman do not fly. Children must be accompanied by an adult. Please let us know if anyone has any conditions such as asthma or diabetes, or is afraid of heights. All ballooning ventures in South Africa focus on launching at dawn, as this is the only time the air is stable. After the safety briefing from the pilot there is “lift off” and the flight generally lasts about an hour, depending on the winds and available landing spots. You will float aimlessly above the earth and go wherever the wind decides to take you, which makes each flight a unique experience. During any good flight, the pilot will gain altitude for views, skim a few tree tops during contour flying, and when brave enough attempt a “splash ‘n dash”. You can expect one of two types of landings - (1) a gentle touchdown, hardly noticing that you have landed, (2) a slightly faster landing where you can expect the basket to possibly drag along the ground for a few metres before coming to a stop. Both are perfectly normal, and depend on the prevailing winds at the time of landing. The retrieval crew will track the balloon from the ground, and be ready to greet you on landing with a traditional champagne toast and cold beverages. When ready you will be transported back to the launch site for a healthy to hearty breakfast, after which you will be presented with a certificate of achievement. For more info read our review of a Hartbeespoort hot air ballooning session. The best way to purchase hot air ballooning is in the the form of gift vouchers. Just mention on filling in the booking form above that you'd like vouchers. monetary value of voucher (e.g. R4200 for 2 adults). You should wear whatever you feel most comfortable in. It is advisable to dress in layers as it can get quite chilly on the launch site but once up in the air you will be surprised at how warm it is, especially under the burners. Casual clothing and flat shoes are ideal, and natural fibres are preferable to synthetic fabrics. Do not wear nylon. You may want to wear a hat to shield your head from the heat of the burners. Gloves, scarves and beanies are recommended during winter. Don’t forget to bring your camera and binoculars. Hot air ballooning is possible at the Cradle of Humankind in Gauteng from R1850 per person. The Cradle of Humanking is a 47 000 hectare destination where ancient fossils have been found in the famous Sterkfontein Caves. Make a visit to the Visitor Interpretation Centre at Maropeng. A Hartbeespoort hot air balloon trip may take you over the dam, with its beautiful views (depending on which way the wind blows). Hot air ballooning was brought to Gauteng in 1981 by Bill Harrop. 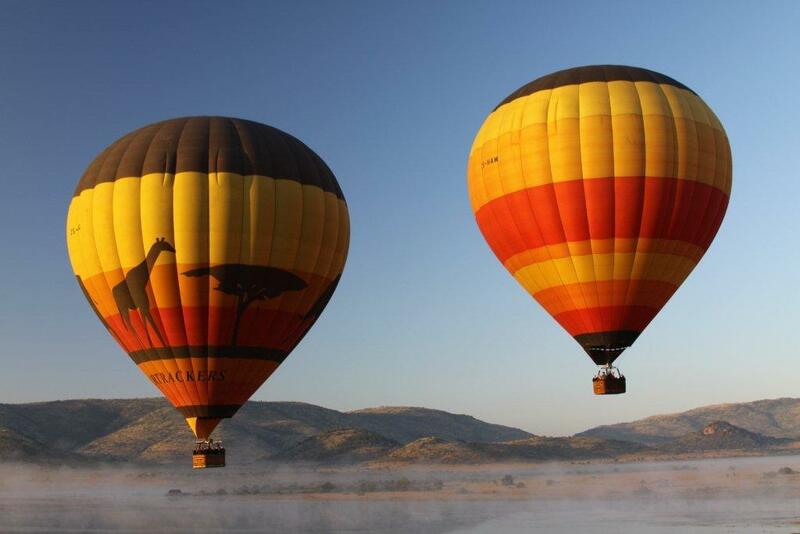 We offer hot air ballooning in the Pilanesberg, in the centre of the National Park (near Sun City). The main venue for Drakensberg ballooning is in Winterton in the northern Berg. Cape Town hot air balloon launch sites vary to suit the wind direction on the day, one of the sites is Joostenberg Bistro and garden center on the N1 towards Paarl and and one is on the N7 towards Mamsbury. Hot air ballooning takes place all year round, but all flights depend on the weather. Hot Air Ballooning SA have expanded to Mpumulanga(Graskop, White River, Pilgrim's Rest and Sabie) early March 2018. They have been operating for more than 13 years with a clean safety record. They use smaller balloons and guarentee that every flight is different. Should you want a more private and memorable experience, give them ago. Their fleet of balloons can accommodate groups of up to 64 passengers with flights varying in heights from brushing the top of trees to touching the clouds. Upon arrival passengers are offered a hot drink and would be offered sparkling wine during or after the flight and then a "Champagne Breakfast" at a restaurant area. Passengers are welcome to assist with various task such as unpacking or inflating the balloon. A lot of fun and giggles are usually had by all. A typical excursion last about three to four hours. Guest need to be at the take-off area approximately 30 minutes prior to sunrise as in Africa flights are typically done at dawn; seldom would the do afternoon flights. Flights are weather dependent and the do have a "no Flight - no Pay" policy. However, in the case of a "no-show" by one or all passengers, the full fare will be payable. Rates for 1-2 persons are: R2800 per person inclusive of flight, breakfast, refreshments and certificate. Rates for 3 - 6 persons are: R2400 per person inclusive of flight, breakfast, refreshments and certificate. To make a booking with Hot Air Ballooning, please use the booking form at the top of the page.